You've landed and can't wait to start your holiday. Only problem is the locals are on holiday as well. Not exactly the best start to your break is it? It's certainly happened to us once or twice. Despite all the planning and organising and last minute double checking, the one thing we never think to research are the holidays of our destination country. We wondered why that was then realised it was actually pretty tough to find a resource for that sort of information. So we decided to make our own. 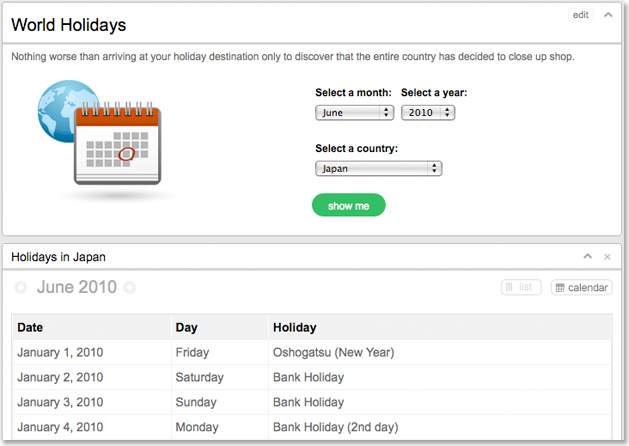 By default the World Holidays Trip Tool is set to show you national holidays in a calendar format month by month but by adjusting your preferences (just hit that 'edit' button) you can also include religious holidays and you can adjust the display type from 'Calendar' to 'List' view with the click of a button. Getting all these holidays together across so many countries has been quite the challenge and while we think we've managed it pretty well we also know it's not impossible that we might have missed the odd holiday here and there so if you don't see your favourite day of celebration listed, drop us a line and let us know what we can bring to the festivities.